The greatest environmental problem facing the peoples of the world today is not Climate Change. For many people in Nations from the USA to Africa, by far the greatest problem is the supply of fresh drinking water. Lack of clean fresh water and sanitation causes many preventable diseases that ruin the health and lives of many children and adults. Diseases such as cholera and malaria are plagues that have been with us since ancient times and still cause countless tragedies in our modern world. The ancient Romans provided Rome and other cities with huge supplies of clean water for drinking, public baths, sanitation and powering mills, it enabled a rapid growth of a healthy population that expanded to build a huge Empire that became the foundation of western civilization today. 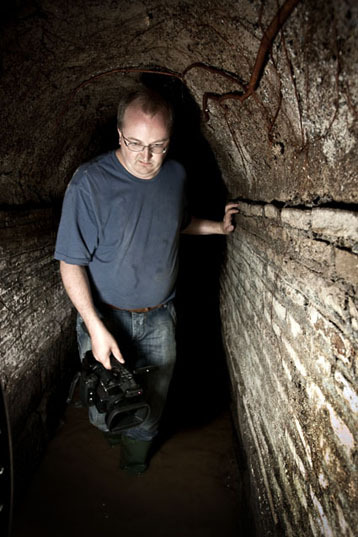 The Roman Aqueduct Hunters are researching in libraries and archives, and investigating both on and under the ground, searching for what remains undiscovered of the ancient Roman Aqueducts. We are looking at the routes of the aqueducts – particularly those ‘lost’ or partially unknown, from their remote sources in the surrounding countryside into the centre of Rome. 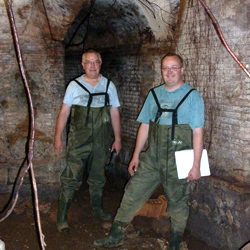 We are investigating the engineering of those aqueducts, and the techniques that the Romans used to build them. We are researching amongst very old documents in dank, dusty archives, and we are looking at the geology and the lie of the land, to see how rainwater accumulated between the strata of rock was collected, and brought clean and fresh to support the healthy growth of an ancient population. After our success in 2009 in identifying the monumental primary source of Trajan’s aqueduct, hidden under a mysterious ancient ruined chapel on the shores of Lake Bracciano, we are hoping to conclude our preliminary study of this aqueduct, and make an initial film of our work by 2012, which will celebrate the 400 year anniversary of its reconstruction by Pope Paul V Borghese. Between the renaissance and the fall of papal rule in 1870 several of the ancient roman aqueducts were re-built, and the restoration of clean water enabled Rome to once again grow as a city. The ancient aqueducts gained new names: One of the last to be built by the Romans, the ancient Aqua* Alexandrina was the first to be re-built by Pope Sixtus V Felice Felice Peretti who gave it his name, the Acqua* Felice. The ancient Aqua Virgo built by Augustus’ son-in-law Agrippa was restored by a whole series of Emperors and Popes and is now known as the Acqua Vergine or Acqua di Trevi which still supplies the Trevi Fountain. The Aqua Traiana became the Acqua Paola or Acquedotto Paolino – named after the Pope Paul V who paid for the reconstruction in the early 1600s. And finally, the wonderfully fresh tasting Aqua Marcia was restored by the nineteenth-century Pope Pius IX Giovanni Maria Mastai Ferretti, who opened the display fountain only days before control of Rome was seized from him by King Vittorio Emanuele in 1870. He re-named the roman water supply the Acqua Pia after his Papal name Pius IX but cunningly left power over Rome’s water supply all privately owned by a British Company. The company was called “Acqua Pia Antica Marcia” of which he owned a major shareholding, so decades after Italy was united, and Italy became a Kingdom and a democracy, the Vatican maintained monopoly control over every drop of water that the Romans drank. So our studies of the living flowing Roman Aqueducts must essentially include their restorations by the popes, and we have to compare papal reconstruction building techniques with those of the ancient Romans to understand what is original and what is renaissance. From the time of the early days of black and white photography until the current time, it is very clear that what still remained 150, 100 or 50 years ago is sadly still being lost or destroyed. Our aim is to document and record in high definition colour evidence that survives today but may very well disappear in the near future. There remain many other undiscovered elements of the Roman Aqueducts to study and record, we do not have any formal links to universities or official or academic funding. So if you would like to be part of our ongoing filmmaking activities by making a subscription, please click here. In return we will provide news and preview release of video and stills, and credit recognition on released film. * N.B. The Latin spelling AQUA often inscribed in stone inscriptions as AQVA is always used in the name of an ancient aqueduct, whereas ACQUA is always used for a modern or papal aqueduct.